A few months ago I mused about “bird’s eye” view perspectives since a residency change afforded me a more “up close and personal” observation from my office. Delightfully this was the beginning of a fabulous time with my new feathered friends…and one seriously persistent squirrel. Bet some of you long-time birdwatchers know what’s coming next but first a little background for those not so familiar with what a squirrel will do for food. Spring brought lots of hummers to the feeder prominently positioned in my patio garden. From my cozy corner of the house, I looked forward to their daily mealtimes. An added surprise was the “big birds” that equally enjoyed the sugar water. A stunning yellow, black and white bird really caught my attention—a male oriole. Quickly fell in love with the distinct sounds of both the males and females to the point I could tell without seeing them which was feeding while working at my desk. Suddenly right after the fourth of July, the orioles disappeared and the hummers were few and far between. Tears came at the thought I’d done something wrong. Not the case. Found out high temperatures can make the sugar water toxic past a couple of days in the feeder and the orioles disappeared because their diet changes from dessert to the main course. They had babies to feed. A quick adjustment with the quantity of sugar water made with a safe preservative brought the hummers back. My first attempt to meet the protein requirement with dried meal worms on a new feeder didn’t go over well. A trip to a specialty bird store launched me into serving live meal worms in a specific dish just for that purpose. The orioles were happy and so was the general bird population munching on birdseed at another feeder just for them. Life was aflutter at Mother Nature’s aviary however, but not just from the birds. 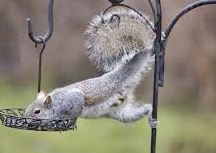 A most-talented squirrel discovered the seed feeder and all attempts to thwart his yoga-like postures to scarf down a birdseed meal were to no avail. A 7-foot shepherd’s hook didn’t even stop him! Online reviews were mixed about the baffle (a metal cone-like pole attachment). Clapping my hands with a loud “No!” was only effective when I caught him in action. His startled response made for a good laugh, though. Made another trip back to the bird store for what is the equivalent of cayenne pepper oil used to coat the seeds. It’s safe for the birds and too hot for the squirrels. Worked like a charm!